Teachers spend a lot of time thinking about how to bring lessons into the "real world." Creating engagement and interest by connecting math to everyday life is a great way to help kids dig into complex concepts that might not come easily. But guess what? 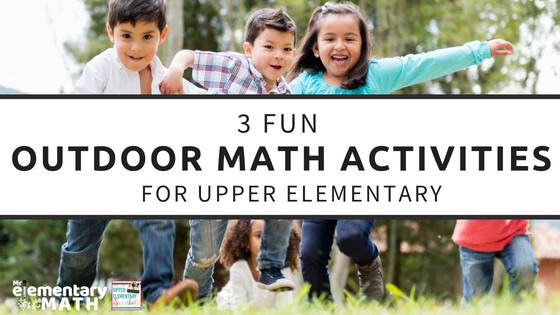 Sunny skies and long, warm days are in store for the next several months, and that means opportunities to bring math into the real world in a more literal sense... by going outside! Choosing to teach math outside the classroom's four walls is a great way to generate some enthusiasm about a lesson (especially if fluorescent lighting is making things a little bleak indoors :). Taking lessons outside isn't just a good idea because of the fun factor. There's actually reason to believe that activity can help kids learn math better, too. 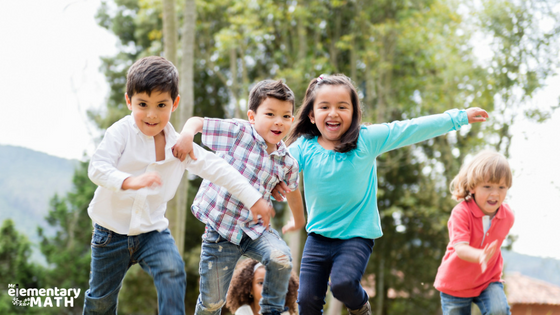 One recent study of 4th and 5th graders in South Carolina demonstrated that math scores were notably higher for children who were given 10 or 20 minutes to exercise and move around as a break, compared to children who received a math lesson in a sedentary classroom environment. What do you call sidewalk chalk, a few tape measures and enough pavement to draw big shapes on? The ingredients for a great math game, that's what. (Please note: If there's no empty area of pavement to use, grass works too. 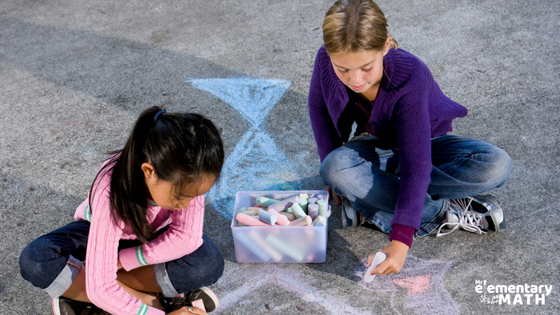 Tape and string are workable substitutes for sidewalk chalk in this case.) This game requires that children be split into groups of 2 or 4. Assign each group a shape that they must team up to draw. It can't be so small that one child could do it by themselves. With the first large shape, specify its exact dimensions. The kids will then need to estimate its sides and draw it as close to those dimensions as they can. Kids can then take the measuring tape and determined how close their estimate is to the actual dimensions. Then, have them make new shapes from the initial shape, but don't give them the dimensions. The only rule is that they must keep one side dimension of the new shape the same as the previous shape. As they make shapes, have them write down what the dimensions are for each shape before moving on. So, if you initially assigned a rectangle and gave them particular dimensions, make sure they label the "estimated dimensions" on their drawing. At the end, the team with the dimensions that are the closest to being mathematically correct wins! Capture the Flag is an old playground favorite, but a little math can make it more about brainpower and less about who's the fastest. Simply choose two teams and have each of them start at a neutral zone, with each "flag" an equal distance opposite the neutral zone. To take a step forward, members of each team have to solve a math problem of your choice. One step fraction-based or multiplication-based problems are good options. These can be adjusted by grade level, but they need to be hard enough to challenge kids while easy enough to do without using paper. Once a team member gets within 5 feet of the rival flag, you can start making the questions harder, with options for the solver to get help from his or her teammates. If a child gets a problem wrong in this portion of the game, they have to take a step back. Make sure no one is taking giant steps forward and tiny steps back because kids will figure out that loophole pretty quickly. Save the most difficult problem for when a team member is within one step of the rival flag. When someone reaches and captures the rival flag, their team wins! If you need questions that work nicely with this game my Flip & Go Math Task Cards work really nicely because there are a 30 different questions in each pack. You can choose different digits or fractions to fill in the grid, but they need to be appropriate for mental math. Then select three children (this can be random, or an incentive for good behavior) to stand on the game board first, one on each grid. The rest of the class should stand in a line in front of the game board. children practice order of operations, depending on what operator is selected in the middle grid. Make it your own! 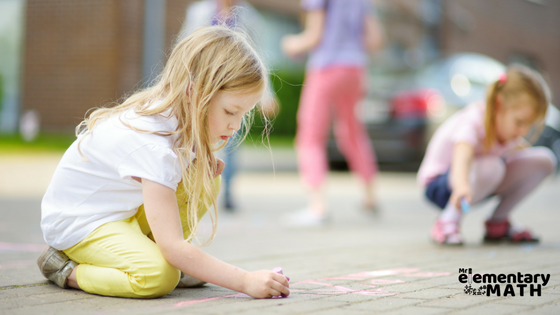 "assign" each other problems, these activities present some fun opportunities for kids to learn outdoors. Looking for more math ideas? 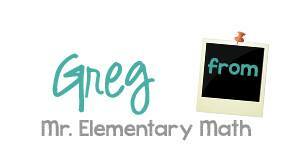 Stay connected with Greg by clicking below.